Step one: Get an 8 inch aluminum or glass pie panStep two: Make pie crust. 2 Tablespoons non-dairy margarine or butter. In a food processor crumble the cookies to a fine consistency. Add to a mixing bowl. Melt the margarine and mix into the crumbled cookies and stir until well blended. Bake the pie crust at 350 degrees for 5 minutes to set. Step three: Make the Pie Filling. In the bowl with the washed berries, add minute tapioca, sugar, cinnamon, and freshly grated nutmeg. Stir gently. 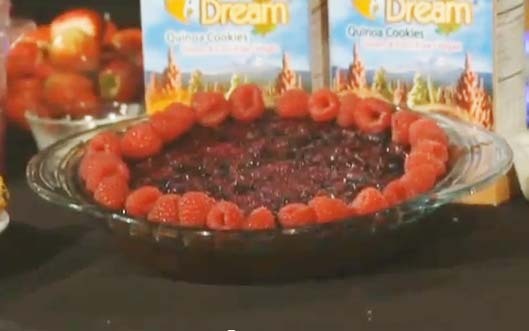 Place the berry mixture in the bottom crust and sprinkle lemon juice over it. With an ordinary teaspoon, place 1/2 teaspoon of soft non-dairy margarine evenly over the top of the berry filling. Bake for 45 to 50 minutes. Check it after 30 minutes. If crust is getting golden but pie filling is not quite congealed, tent the pie with aluminum foil to keep crust from getting too brown. Serve and enjoy. Can serve with whipped cream or a la mode with a scoop of ice cream.